Muharrem İnce looks on in the background as CHP leader Kemal Kılıçdaroğlu speaks at a party congress ahead of the June 24 elections. COLUMNS What are the US and Russia cooking up in Syria? The opposition alliance, heralded by the Western media as a viable force to defeat President Recep Tayyip Erdoğan in the June 24 elections, lies in complete disarray. The nationalist Good Party (İP), a key partner of the alliance, has already announced that the group has collapsed. With President Erdoğan receiving 52.5 percent of the votes in the presidential election, and the People's Alliance between the Justice and Development Party (AK Party) and the conservative Nationalist Movement Party (MHP) winning a majority in Parliament, the opposition alliance simply became redundant and worthless. This also proved that they had only come together to "stop" Erdoğan and had no real plans or projects for the nation if by any chance they won the polls. They were simply paper tigers, fooling the masses. 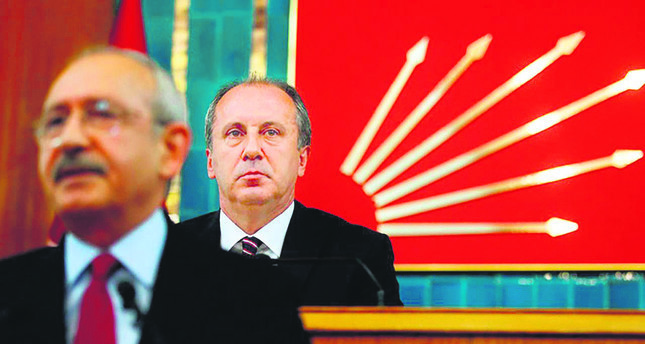 Some so-called Turkish commentators and "experts" who wrote fiery articles in prominent Western newspapers claiming that Erdoğan's days were numbered and that Muharrem İnce was slated to win the presidential elections only proved that they are highly biased, misinformed, unreliable and are poorly qualified to make sensible evaluations about the Turkish political climate.The election results did not only lead to the collapse of the unholy opposition Nation Alliance, formed by the left-wing Republican People's Party (CHP), the Felicity Party (SP), the tiny Democrat Party (DP) and the İP. Now, these parties are also facing some serious internal problems. The CHP not only lost the presidential race – despite the relatively strong showing of Muharrem İnce with 31 percent of the votes that easily surpassed CHP's 22.5 percent in the parliamentary polls – it also could not win a majority with the alliance. Party leader Kemal Kılıçdaroğlu is now regarded as a great failure and there are popular demands to replace him with İnce. However, Kılıçdaroğlu rejects calls for his resignation. İnce and his supporters will apparently try to force a party convention to topple Kılıçdaroğlu.The so-called main opposition party is not only divided but is shifting aimlessly on a rocky terrain. This is the same party that would have ruled Turkey if it was successful in the June 24 elections. They are not even equipped to shoulder the role of the main opposition. Then, of course, there is the Meral Akşener's İP. In the initial stages of the election campaign, she was billed as a great hope against Erdoğan but as time went by and İnce became the CHP's presidential candidate, she lost her standing with the electorate and was eventually a dismal failure in the presidential race. Her party managed to get into the Parliament despite failing to pass the 10 percent threshold, simply because the party was part of the Nation Alliance. Temel Karamollaoğlu who chairs the SP was also a great loser, having no impact in either the presidential or the parliamentary elections. The state of these parties and the state of their presidential candidates clearly shows that Turkey had a lucky escape on June 24. Sadly, supporters of the opposition alliance completely fooled some foreign states and the Western media with false expectations. Let us just hope that they have learnt a lesson and will not be fooled again by some "Turkey experts and columnists."